Put all the tapenade ingredients in a food processor and blend together to a coarse paste. This will make more than you need for six people, but it can be kept for up to a week in the fridge, and will improve in flavour. 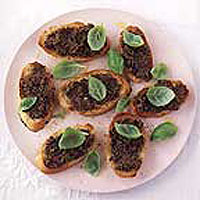 Grill the bread until golden, brush with oil and top with tapenade just before serving.